Penelope – Pos, graduated from Melbourne University in 2001 with a Bachelor of Science and Bachelor of Veterinary Science with Honours. She has worked in the equine performance and pleasure horse industry for 12 years with a large proportion of her time spent on the racetrack and more recently in Mansfield, Victoria. 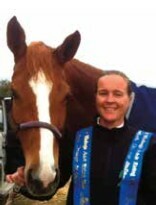 She is married with two children and is principal veterinarian of Progressive Equine Veterinary Services. Her current practice focuses on general ambulatory medicine with a lot of lameness and laminitis issues. During the spring months she does a fair proportion of reproductive work. The clinic manages the veterinary testing for pre-export quarantine for horses being exported to Asia, Europe and South Africa and Pos also advises and performs veterinary duties for the Victoria Mounted Police Branch. Her experiences in the performance horse industry with respect to feet issues has been a major focus in the way she views foot treatments. In the last four years she has been assisting Andrew Bowe and his team in providing veterinary advice in treatment and pain relief. She hopes to convey some of the more successful management strategies she has found useful in the daily management of acute and chronic foot issues and pain.